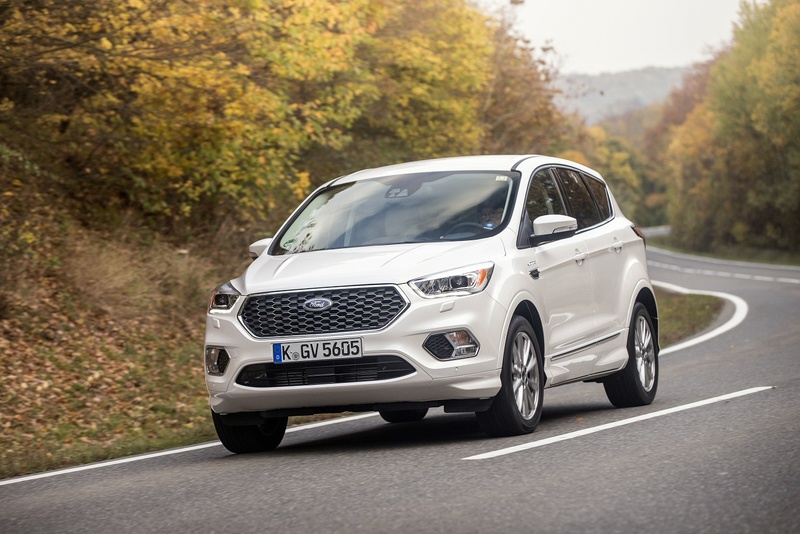 The Ford Kuga has sharpened up its act to the point where the Blue Oval brand thinks that this better-specced, more exclusive 'Vignale' version might even appeal to buyers of premium brand SUV Crossovers. 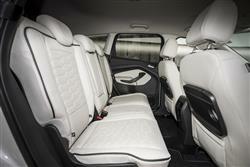 Enhancements include a much nicer cabin and more personal dealer service. The Kuga has long been one of the better SUV Crossover models to drive and this improved second generation model maintains that tradition. Body control is better regulated than it is on most other segment rivals we've tried. Plus the well-weighted power steering and electronic aids like 'Curve Control' and a torque vectoring system for extra cornering grip all add to the confidence you feel behind the wheel. Opt for a model fitted with Ford's 'Intelligent AWD' set-up and you can carry that peace of mind forward into really slippery conditions, this being one of those 4x4 packages that continually monitors your driving environment, optimising traction to direct power between the wheels as required. 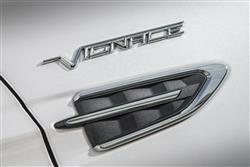 You'll want to know about engines. Vignale buyers get petrol power only with auto transmission; the 1.5 EcoBoost unit is offered with 150PS and front wheel drive. Or 176PS and AWD. As for the diesels, well most are likely to opt for the 2.0-litre TDCi diesel, available with 150PS, manual transmission and front wheel drive. 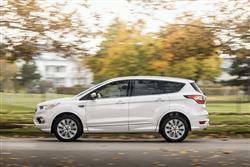 Or 180PS and AWD, with a choice or manual or PowerShift auto gearboxes. Buyers of this Vignale variant get a slightly smarter front grille and subtle bodystyling changes, plus more exclusive-looking 18-inch alloy wheels and LED tail lamps. 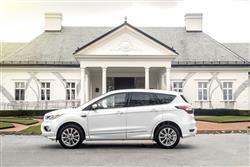 Otherwise, the look is the same as that of any other up-pec Kuga, enhanced at the front by Bi-Xenon headlamps that can adapt themselves to road and cimate conditions as you drive. 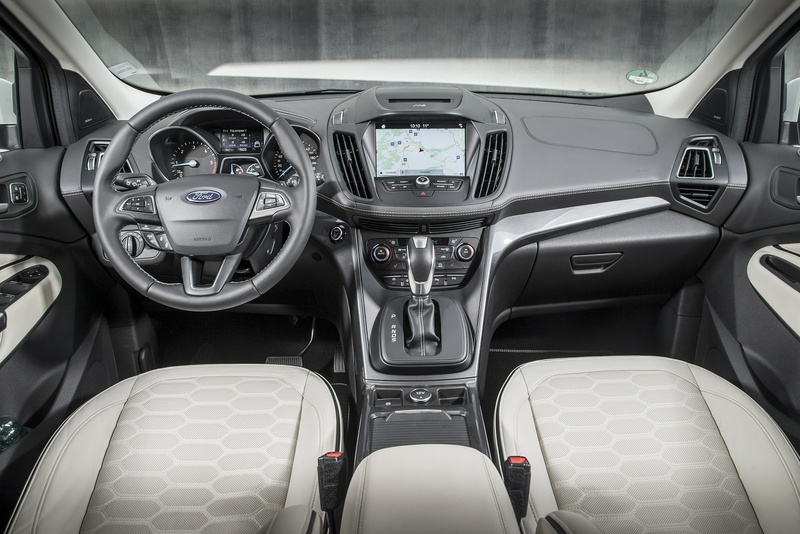 Inside, the cabin's much smarter than it was in previous Kuga models, a hi-tech 8-inch SYNC3 infotainment screen removing a lot of the previous cabin button clutter. This package offers fast activation, large buttons, easy app integration and, perhaps most importantly, functionality that allows you to duplicate the operation of your smartphone onto the central fascia screen via either 'Apple CarPlay' or the 'Mirror Link' 'Android Auto' system. 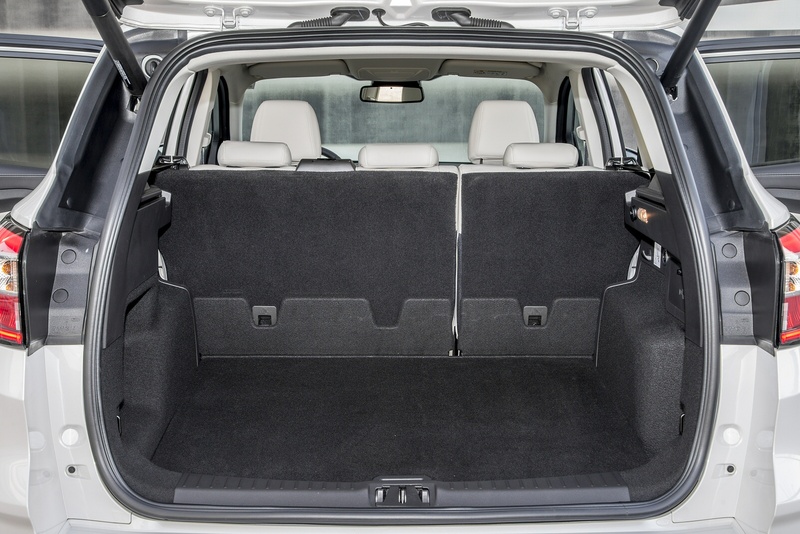 In the back, the central transmission tunnel's usefully low and it's important to note that there's as much room for legs, knees and heads as in the best of this Kuga's rivals. The bench can't feature Volkswagen Tiguan-like sliding functionality, but the backrest does recline for greater comfort on longer journeys. Out back, there's a 456-litre boot. 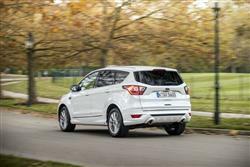 Kuga Vignale prices start at just over £33,000, which means a £3,500 premium over the best-equipped models in the standard range, the 'Titanium X Edition' and 'ST-Line Edition' variants. As a 'Vignale' buyer, you'll have a 'Relationship Manager' assigned to you to look after your ownership needs, someone who'll be on hand both at your local dealership and via a dedicated hotline. When the time comes for servicing, you'll enjoy a free collection and return service and after every garage visit, your car will get a complementary carwash and premium valet treatment. In addition, as you'd expect, you get more kit on a 'Vignale' variant - things like exclusive two-tone 'Tuxedo' quilted leather upholstery, a rear view camera, LED tail lamps and special finishing inside and out that includes a bespoke body styling kit and a unique front grille. In addition, the SYNC3 infotainment system gets an upgrade to include 3D navigation display and a 9-speaker Sony stereo. 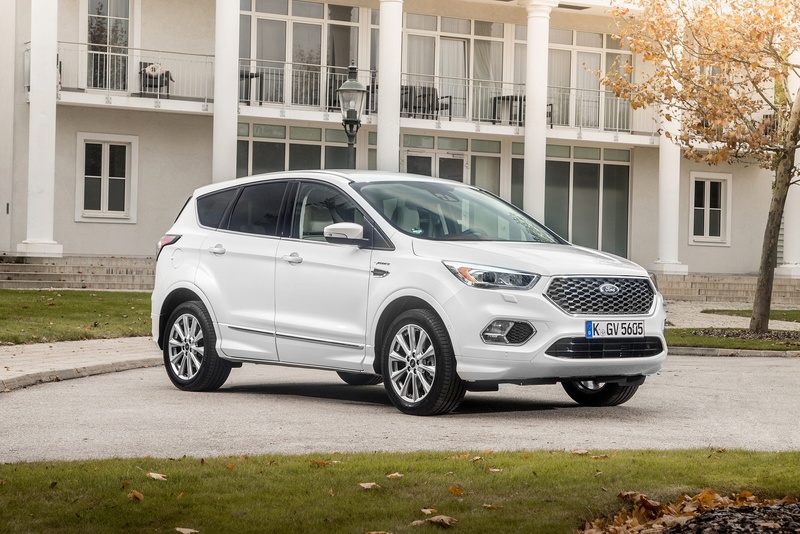 There are also Bi-Xenon headlamps with a jet wash, a special 'Vignale' leather steering wheel and an 'Active Park Assist' system that steers you into spaces. 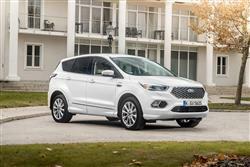 Ford has pulled out all the stops to make this current Kuga more economical. For example, an Active Grille Shutter is fitted to all versions. This closes the front grille, reducing aerodynamic drag when the radiator isn't in need of additional cooling and then reopens it upon demand. Auto-Start-Stop is also standard across the range. 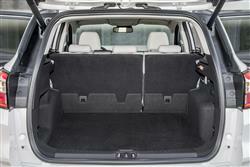 Features like an Eco Mode and a Gear Shift Indicator help keep your right boot out of the carpet. The front-driven 2.0 TDCi 150PS model manages 39.2mpg and 151g/km. 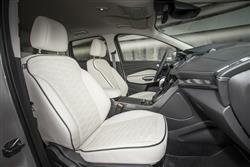 For the 2.0 TDCi 180PS AWD manual derivative, it's 37.7mpg and 181g/km. And for the 2.0 TDCi 180PS AWD auto, it's 38.7mpg and 171g/km. 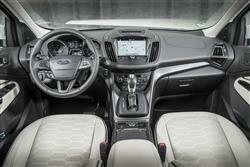 Go for the 1.5 EcoBoost 176PS variant and those figures fall only marginally to 29.1mpg and 208g/km. 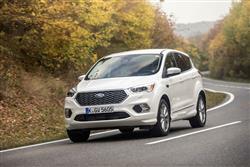 If you�re looking for a new Ford Kuga Vignale 1.5 EcoBoost 176 5dr Auto Petrol Estate for sale, you�ve come to the right place. 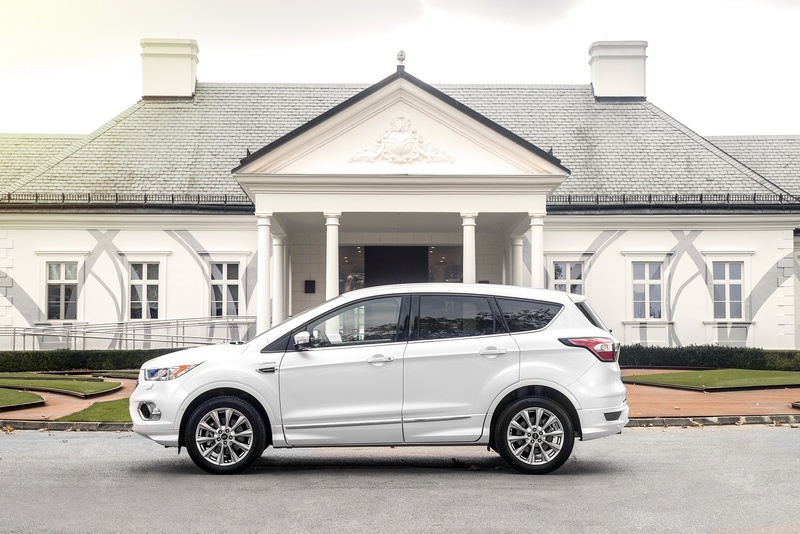 At Bristol Street Motors we don�t just have the best Ford Kuga Vignale 1.5 EcoBoost 176 5dr Auto Petrol Estate deals, we also offer friendly advice and help with all your enquiries to ensure your buying experience is a happy experience.